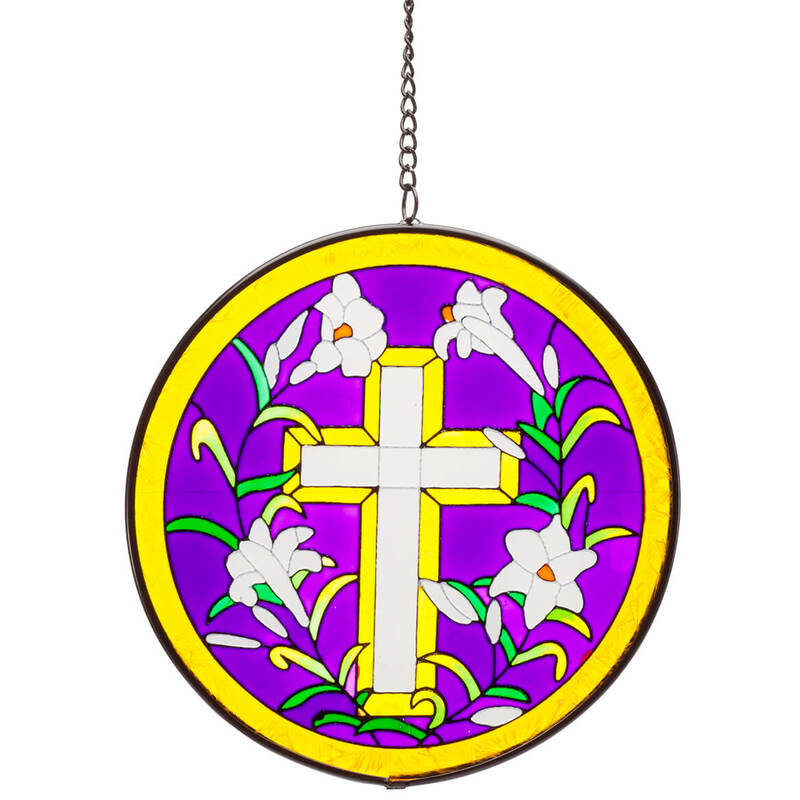 Celebrate the light and hope of Easter with this shimmering stained glass Easter suncatcher. Transforming rays of sunshine into bright, glorious beauty, its intricate design boasts brilliant color and artful detail, featuring a cross and white lilies, encircled in golden glass and set in a metal frame. It includes an attached hanging chain with hook for easy display. Glass suncatcher measures 6″ dia. with 4 1/2″ hanging chain; 10 1/2″ long overall. 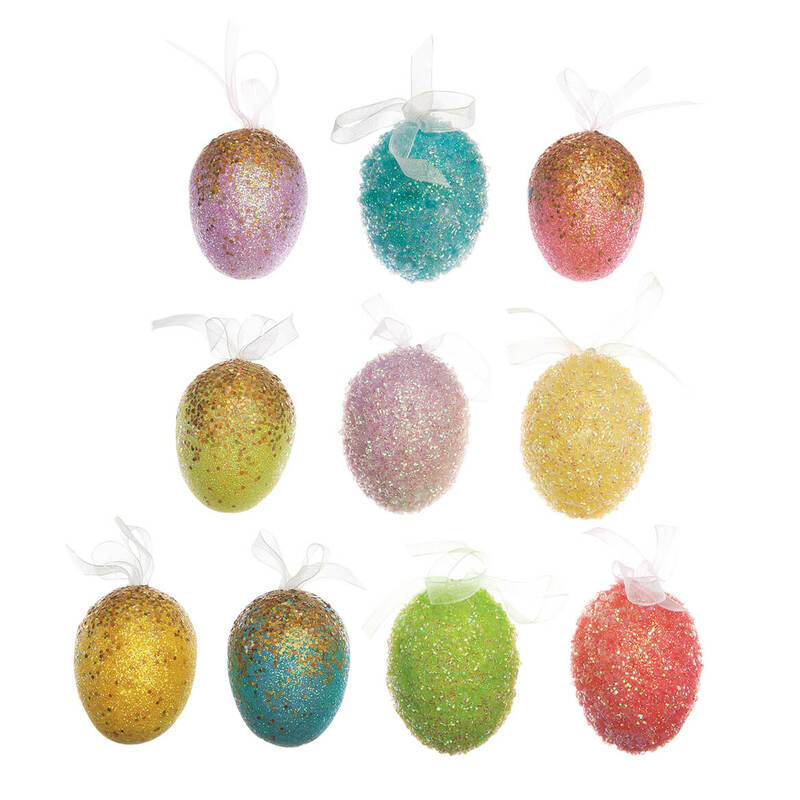 Easter treats sparkle like magic when tucked inside these colorful glass egg boxes. The shimmering 2-pc. Easter decorations feature curvy-rimmed lids to open and close, so they can hold Easter candy, small jewelry, coins or small keepsakes. 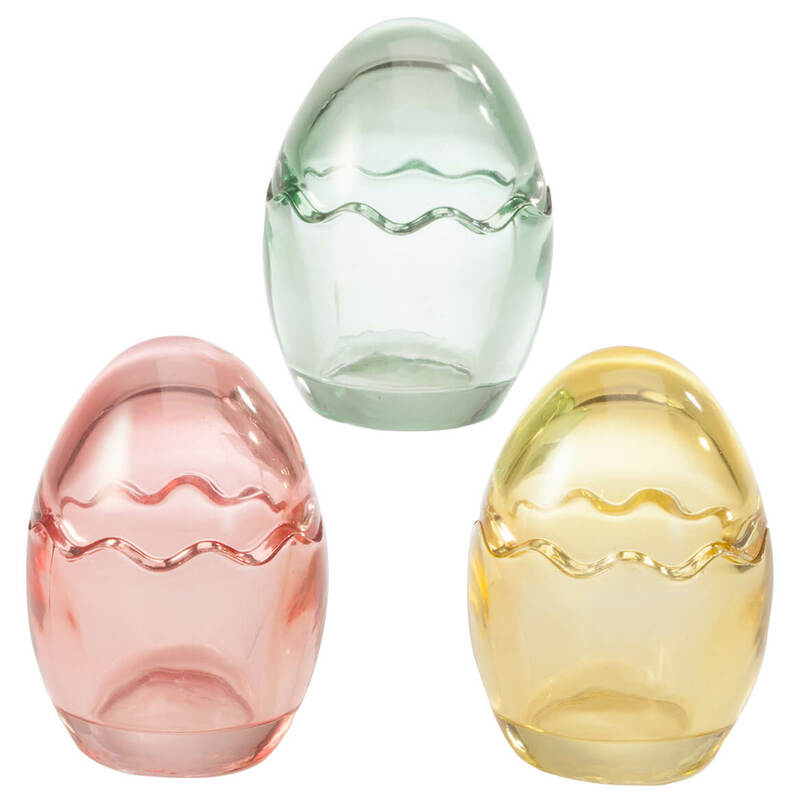 Perfect for giving or to enhance your own holiday décor, the set of 3 Easter table decorations includes green, yellow and pink lidded egg boxes. Each, 3 3/4″ high x 2 1/2″ dia. 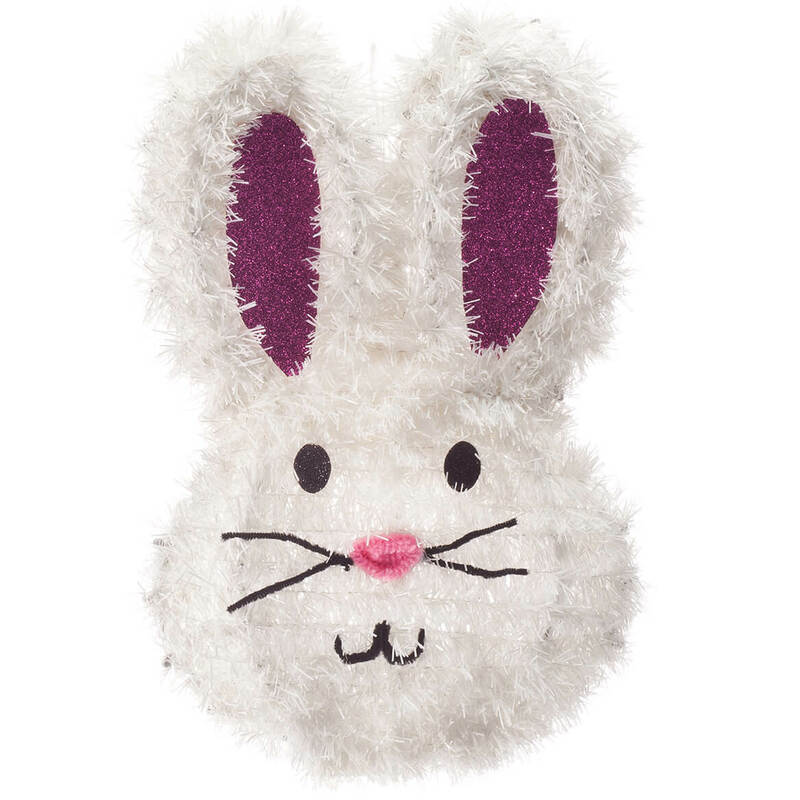 Hand wash.
Greeting guests with dazzling cheer, this glitter bunny hanging decoration shimmers—year after year! A fun holiday touch for your front door, entryway or any inside wall, our hanging decoration features white plastic “fur” with a hint of iridescence, along with pink glitter ears, sparkly black eyes and cute pipe cleaner mouth, nose and whiskers. He’s lightweight, yet durably crafted of 95% plastic/4% paper/2% polyester/2% steel wire with a ribbon hanging loop in back. 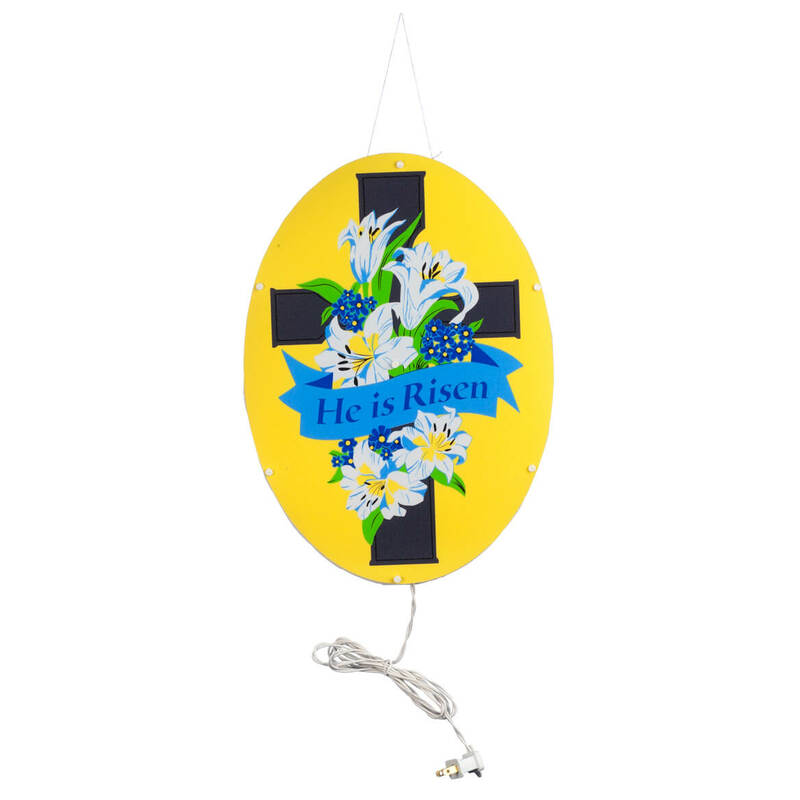 A quick, affordable way to decorate your home for Easter, our Easter decoration is designed for indoor or protected outdoor use. 13″ long x 8 3/4″ wide. With 10 Easter ornaments, this Easter decorations set makes decorating easy … without “hopping” off your budget! Designed in gorgeous pastel colors, the set includes 10 sparkling eggs with fancy chiffon bows. Attached hangers allow easy display on Easter tree, wreath, centerpiece, chandelier, mantel and more. Plastic, wire, polyester. Set of 10 Easter tree decorations. Eggs: 2 1/2″ high. 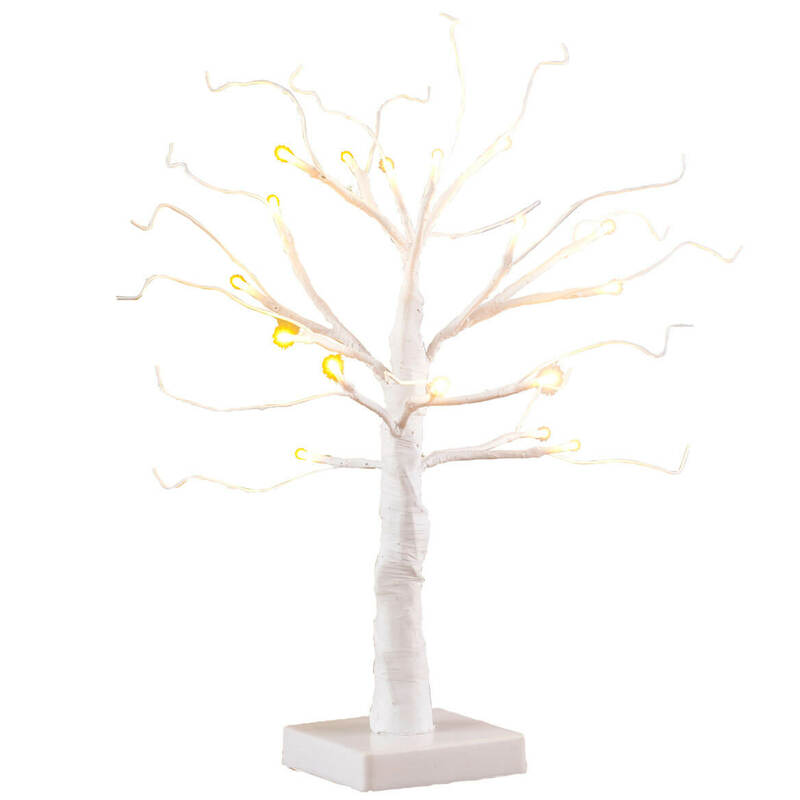 Sparkling with white LED lights, this white wire 18″ all seasons tree celebrates Easter, 4th of July, Halloween, Valentine’s, St. Patrick’s Day, Christmas, even birthdays! The versatile decorative tree’s wire branches bend to accommodate your decorations (allowing easy storage, should you ever take it down). Pre-lit with 18 LED lights on branch ends, the wire tree features on/off switch and timer (sets for 6 hours on/18 hours off). Uses 3 AA batteries (not included). 18″ high. 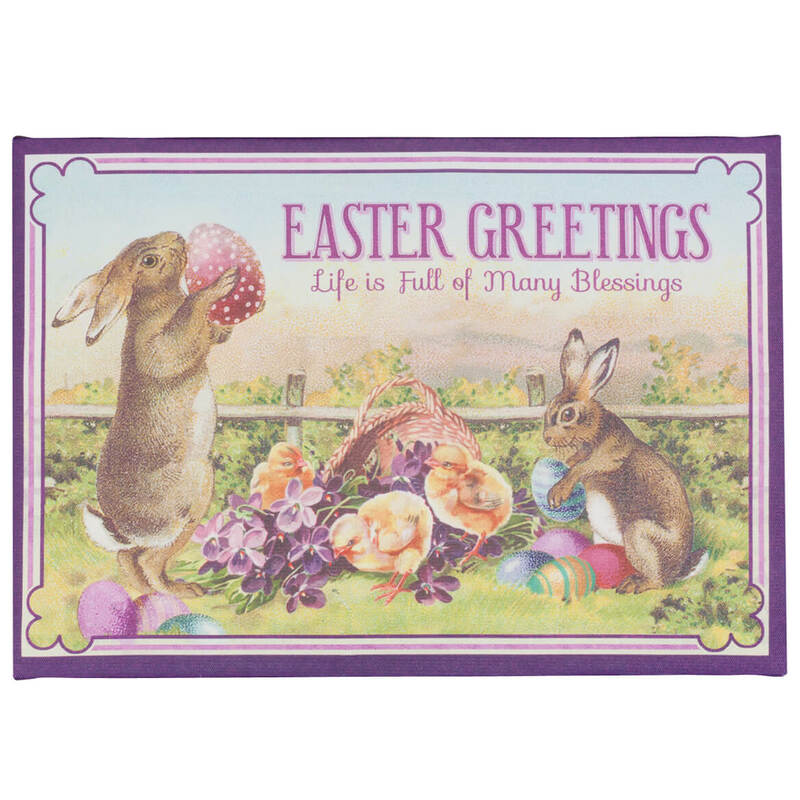 Enhanced with the soft glow of LED lights, this Easter Greetings Lighted Canvas by Northwoods™ “Easter Greetings” confirm, “Life is Full of Many Blessings”. Graced with bunnies, chicks, fancy eggs and flowers, the colorful canvas art comes to life when illuminated by bright, long-lasting LED bulbs. Cord-free for easy display, it uses 2 AA batteries (not included); side on/off switch lets you activate without removing canvas from the wall. Adding beauty and light to your Easter décor, the exclusive lighted canvas includes sawtooth hanging hooks. Wall canvas measures 16″ long x 11″ wide. Filling hearts with hope, our faith-inspired “He is Risen” shimmer light by Northwoods™ shines with the message of Easter: “He is Risen”. Glowing with 10 LED lights sparkling through a prismatic surface, the classic cross window light is exclusively designed by Northwoods™. Complete with suction cup for easy mounting to windows or walls, it’s UL® listed for indoor/protected outdoor use. Plastic. Holiday light measures 15 1/2″ long x 11 1/2″ wide; 60″ long cord. 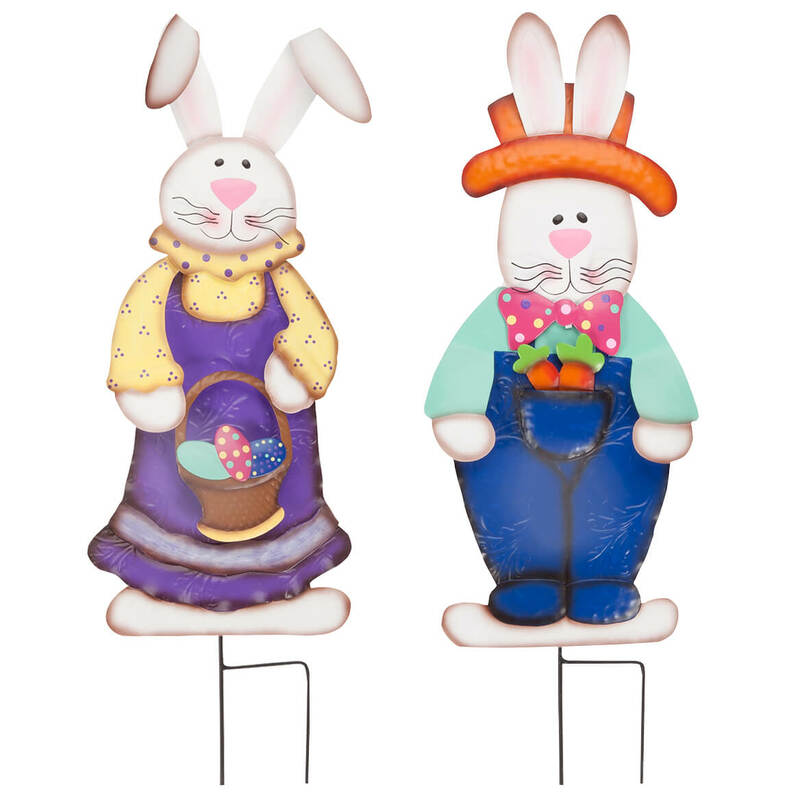 Greet Easter guests with our cute metal Easter Bunny boy and girl garden stakes and share a little springtime joy! Adding holiday charm to your outdoor décor, these decorative garden stakes are crafted of hammered, painted metal with amazing detail. Staking easily into lawn or garden, these versatile yard ornaments also include 2 hooks for hanging to front door, wall or fence. They’ll be part of your Easter celebration for many years to come. Easy assembly. Boy is 9″ wide x 22″ high with stake. Girl is 8 1/2″ wide x 22″ high with stake. Sweet Easter bunnies and cheerful pastel checks transform classic kitchen linens into holiday favorites. Woven of soft, absorbent cotton, the versatile tea towels are great for drying dishes or lining bread baskets—and the set makes a thoughtful gift for grown-up Easter baskets or holiday hosts. 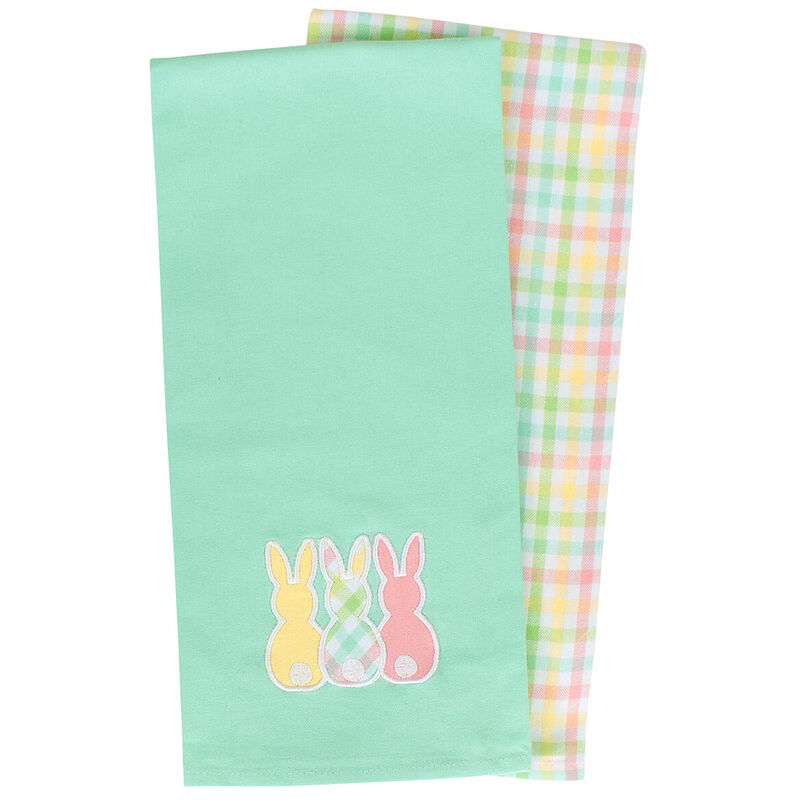 100% cotton; machine wash. Set of 2 includes mint green tea towel with Easter bunny appliqué and coordinating plaid tea towel. Each, 14″ x 22″. Imported.